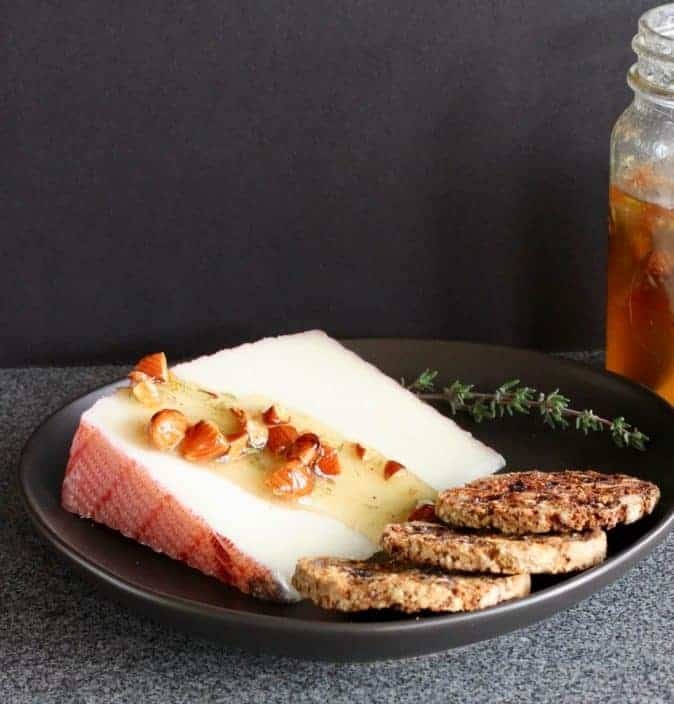 Almond Thyme Honey is honey infused with nuts, dried chile, thyme and orange zest. Drizzled over cheese, it’s an easy, elegant appetizer and also a sweet gift. Plus some honey themed gifts. So we got the bees and he was on board. He has become the head beek (or King) and finds them to be a great hobby. We love watching them, learning more about these smart creatures and using all things honey bee. 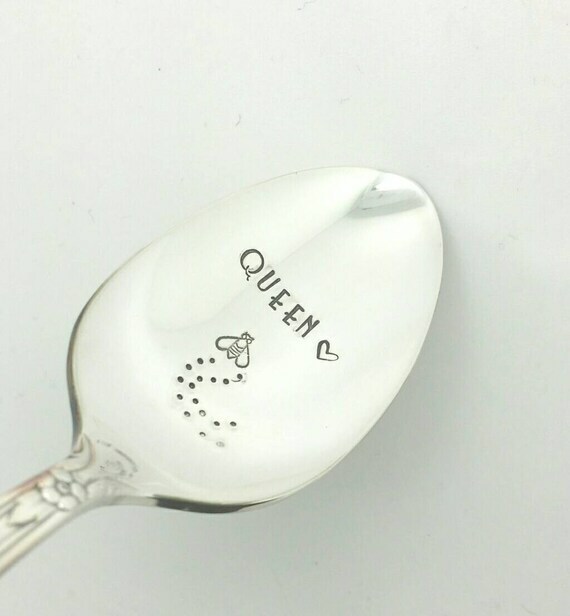 So, I’m not the Queen. 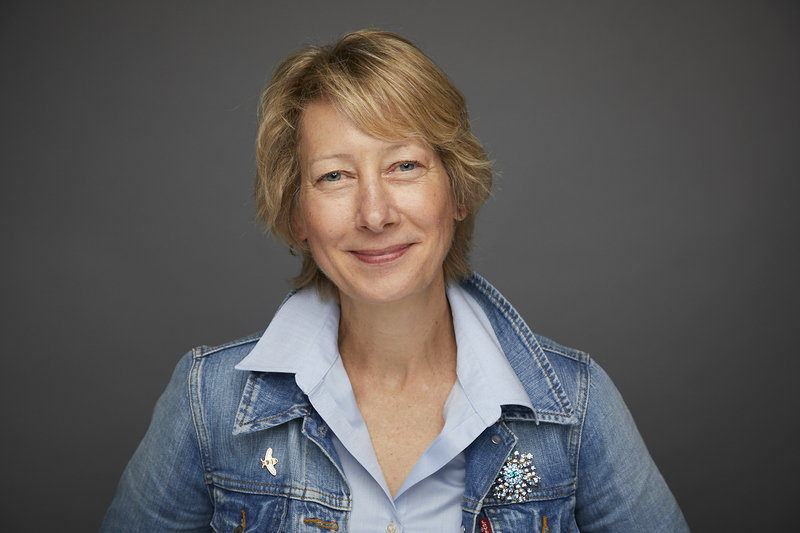 The real Queen Bee deserves the Queen title. Her personality dictates the nature of the hive. A docile queen has a docile hive. The hive is devoted to their Queen. They feed her and keep her comfortable. When the temperature drops to 53° F., they cluster around her flapping their wings to keep her warm. Like 93° F. warm! She’s also a busy bee. During most of the year she may lay up to 2,000 eggs per day. No matter how much honey we collect from our busy bees, I still love dipping in the honey jar. 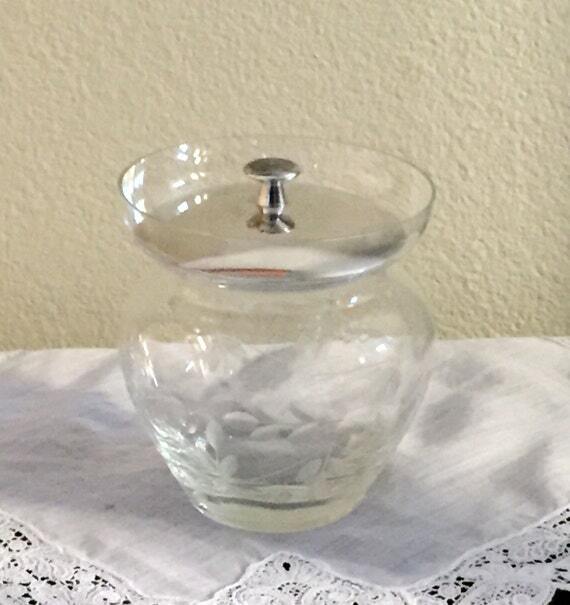 I use an antique jam jar for honey at the table. It makes me buzz with happiness. Though when I saw this Alessi Honey Jar, I started having second thoughts on the above! I’ve been a fan of the simple, creative Alessi designs for years. In fact, I bought this Alessi Honey Dipper for a tea-drinking friend last year. And one for myself, too. I love the honey comb shape! Because it’s stainless steel, I put it in the dishwasher. Do you have special towels you pull out for company? I also give towels as hostess gifts. I wrap a bottle of wine, a jar of honey, or these Apricot Pecan Crisps. 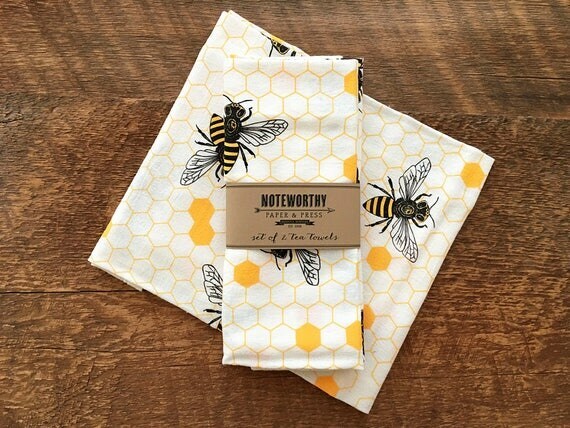 Thinkin’ these Honey Bee Towels would bee cute! 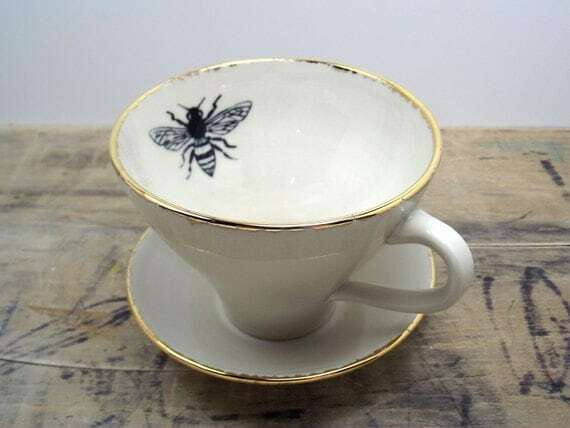 This porcelain tea cup made me smile. Can’t you see yourself sipping a cuppa somethin’? Could be tea or a hot toddy with water, whiskey, lemon and honey while you read The Secret Life of Bees. 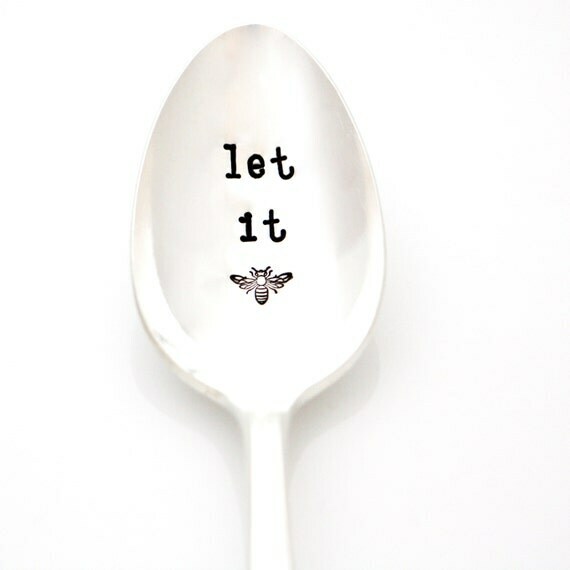 This vintage spoon is a perfect reminder to let it go. Er, let it bee. Or try a mask such as Pharmacy Honey Potion antioxidant hydration mask. The hexagonal shape of honeycomb keeps me in awe. Awesome, that bees use the comb as a nursery to raise the baby bees and to store their food (honey). These genius architect’s use the walls of the hive and neighboring cells to maximize efficiency in building the six-sided wax comb which uses less energy (honey) to build the comb they need. Without any gaps, the hexagon shape holds the maximum weight with the least amount of material. 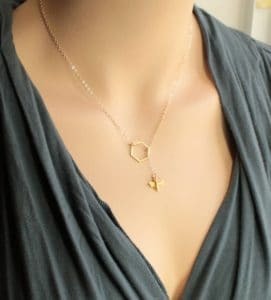 This Honeycomb necklace is a great example of that simplicity. Rather than get a bee in my bonnet, I’m following Winnie the Pooh’s advice, “Bee Positive. All Day. Everyday.” The Hive Rules may not win the spelling bee, but they are something to stick with! 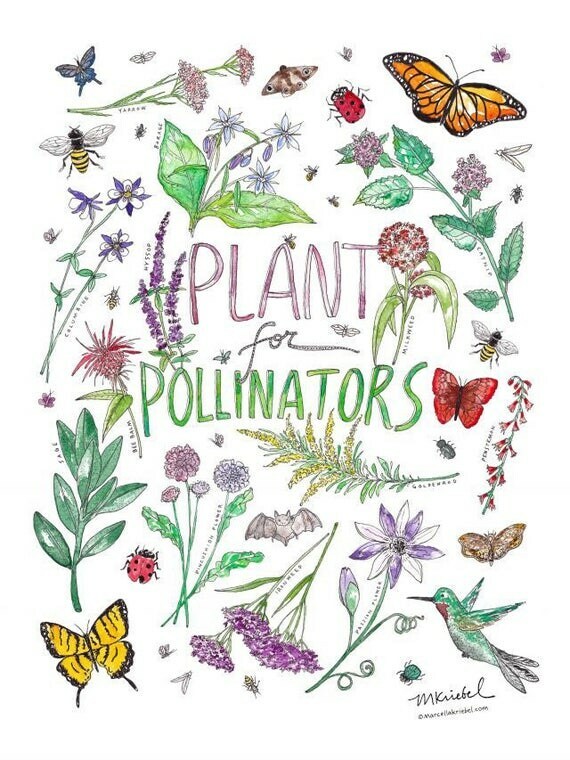 This cheerful art print of Plant Pollinators reminds me it’s not just bees who do all the heavy lifting! It was sweet seeing all the bee love as I shopped. 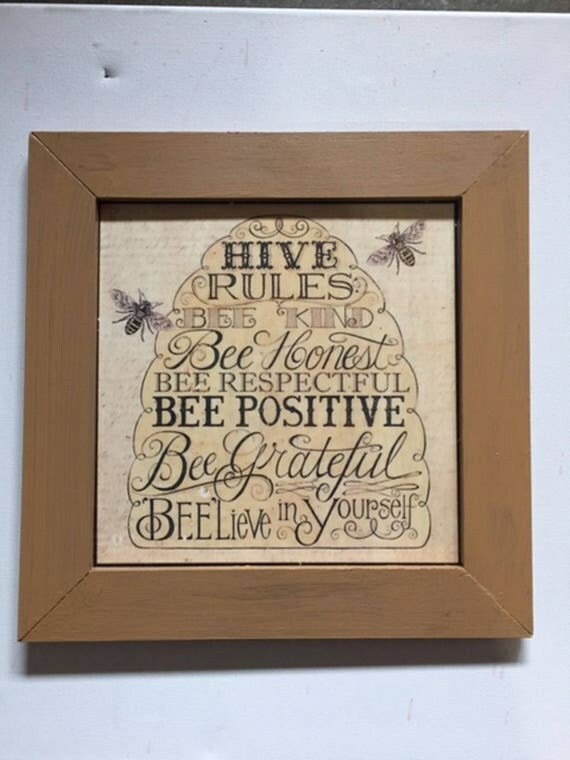 Plus I found some fun bee and honey gifts for you (and me). I invite you to learn about beekeeping and meet the hives here. I’m always looking for ways to cook with the honey from our hives. I’ve looked at lots and lots of recipe books and Taste of Honey is the one I bought. 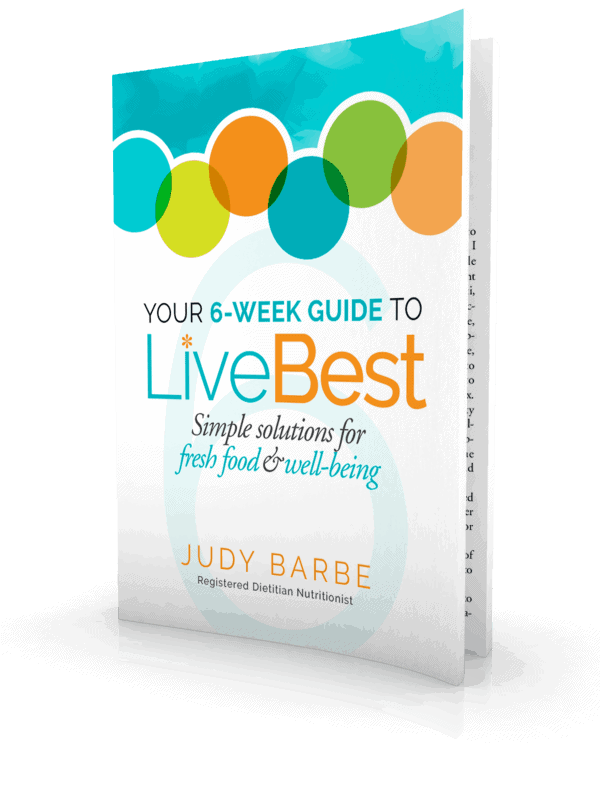 I’ve written two books filled with food solutions, Your 6-Week Guide to LiveBest, Simple Solutions for Fresh Food & Well-Being and LiveBest Seasonally. I’ve included links to some of my favorite recipes on the blog below. Maybe my next book should focus on honey recipes! Measure the oil before measuring honey. The oil helps the honey slide right out of the measuring cup. Use a liquid measuring cup to measure honey. The kind with a pour spout. And now the recipe. 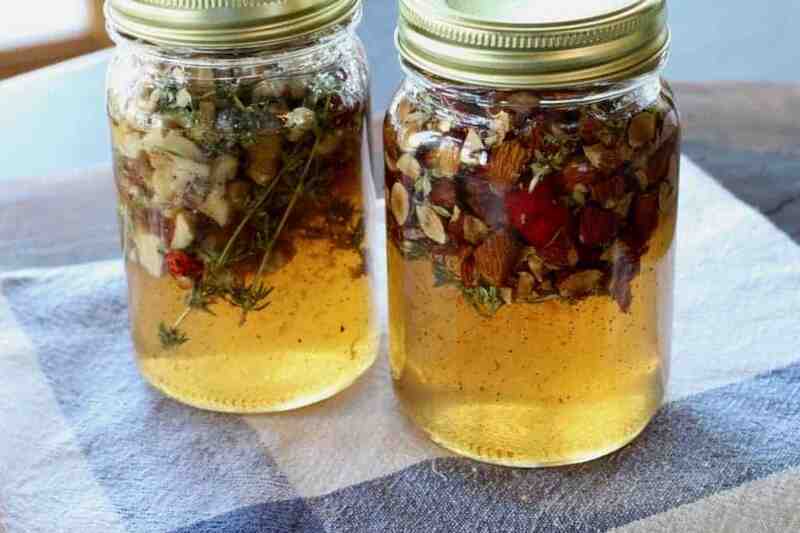 Almond Thyme Honey is honey infused with thyme, orange zest, nuts and dried chiles. It is super simple to make. You can use walnuts, pecans, hazelnuts, pine nuts…about any lil’ nut you like. I serve it drizzled over cheese. 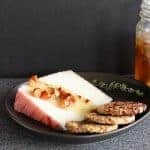 The photo is Manchego cheese but it’s great with blue cheese, Parmesan, white Cheddar or Swiss. Guess I haven’t found a cheese I don’t like it on. But I’ve also eaten it on a peanut butter sandwich and I’ve drizzled it over yogurt. I love it with the Apricot Pecan Crisps in the photo. This post contains affiliate links. That mean if you click on a link and make a purchase, I will make a small commission. This does not affect the price you pay. If you like the recipe share it on Facebook or save it to Pinterest so you can find it again later.